...Our Mission has been To create the foundation and future for the Rabondo community by providing education and scholarship support to its youth. Here's just a small sampling of the work we have done with the Rabondo community over the years. Hauling buckets of water for miles is a grueling task that was part of daily life in Rabondo village until we constructed a water well with your donations. The well has dramatically improved the lives of not only the children, but the entire village. We sponsored Shelliah to travel to America when she was only 11 where she has been receiving an education and living with an incredible host family we work with. Here she is visiting family after 4 years of hard work. We are very proud of Sheillah and her accomplishments, and hope to see many more success stories like her's in the future. Timon Bondo is hard to miss with his bigger-than-life smile, hearty laugh and effervescent spirit. Though lighthearted in most aspects of his life, Timon is serious about helping the children of Rabondo, Kenya, a small subsistence farming community where he grew up. Fraught with AIDS, poverty and a sense of hopelessness for the past decade, Rabondo is experiencing dramatic change because Timon is taking action. Timon may not be whom you picture when you think of a hero. While his story carries a legacy of heroic proportions, Timon himself is an unlikely superman. Unsure of his actual age due to a lack of accurate birth records, Timon estimates that he is somewhere between 65 and 85 years old. His youth is not the only thing slipping away; he has been losing his eyesight for the past 10 years and now is almost totally blind. So how, then, did an aging and ailing man almost single-handedly restore a sense of hope to a village that is nearly 8,000 miles from where he sits today? Admittedly, Timon acknowledges that he is neither a genius nor a millionaire. Determination, patience and a vision of education were the guiding and abiding lights of Timon’s efforts as his programs continue to strengthen and save Rabondo’s children and community. It was a visit to Kenya in 1996 that shifted the focus of Timon’s life from Minnesota, where he lives today, back to Rabondo. According to Timon, this visit showed him a Rabondo that he never knew existed. HIV and AIDS had infected many people and they lacked access to basic health care, medication or information about the disease. “When I went back in 1996 it was dramatically different. [Because of AIDS] I saw a lot of orphans and widows, and there were people of productive age dying of disease.” Without parents, many children were forced to fend for themselves: finding shelter and food where and when they could. This community existed without sanitary facilities, safe water, electricity, motorized vehicles or businesses. To make matters worse, the only existing school in Rabondo was crumbling to the ground and scheduled for closure by the government. Reggie Achieng, 5, and maurine atiyo, 6, cousins and best friends, sit outside of Atiyo’s mud home. Achieng is known in the village for her contagious smile, a reminder of her uplifting spirit. Timon was then left with the dilemma of how to repair a community and school system already on a path to destruction—all as a one-person army. Without a background in community organizing, non-profits or development, Timon had quite an undertaking ahead of him. Growing up in Rabondo for Timon was not the complicated and hopeless way of life that he witnessed in 1996. Timon recalls the prevalence of a barter system as a way of exchanging goods and services when he was growing up. As a child he had dreams of becoming a doctor or engineer, always knowing that he wanted to help others in some way. The hardship of losing his father when he was in third grade required Timon to help support his mother and family through farm work. That experience caused him to learn the importance of responsibility, hard work and to care for others. Timon’s educational journey took him well beyond Rabondo. Interestingly, when growing up in Rabondo there was not a primary or secondary school for Timon to attend. Instead, he stayed with host families in three-month intervals, 50 miles from Rabondo in order to attend school. After completing high school, Timon left Rabondo and the outlying rural communities for Nairobi because he knew he wanted to seek opportunities in a city. In doing so, he rode a bus for the first time and moved to a city where he knew no one. After working odd jobs in Nairobi, Timon moved to Germany for a short time. After three years of traveling, he eventually moved to the United States. He attended the University of Minnesota where he majored in Agricultural Economics. He then went on to receive his master’s degree in the same field from Kansas State University. Soon after that, he came back to Minnesota to work in sales and insurance. He was unaware of the serious nature of Rabondo’s problems until he visited in 1996. Preschool and kindergarten students at rabondo’s nursery practice the alphabet. Due to overcrowding in the primary school, the younger students study outdoors under a thatched roof. 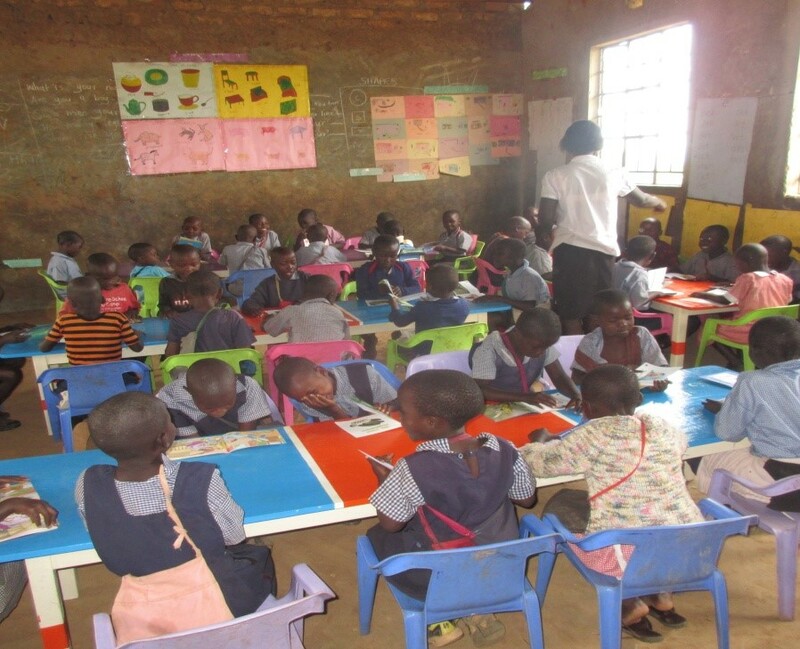 Timon focused on efforts to provide education to the children of Rabondo as a way to encourage the young and empower the community as a whole. Timon believed education would help prevent HIV infections because students would be taught how the disease is transmitted, how to respect themselves and how to plan for their future. “Education is the only weapon that you have in a Third World country,” Timon says with conviction. With so many problems in Rabondo it was hard for Timon to focus on efforts to improve just one, but he decided to start with building a primary school. This way children could attend classes in an actual classroom as opposed to the outdoor sessions they had been having for quite some time. It would offer a place to focus on studies and help children get into the mind-set of being students. Fredrick Ochieng, the assistant principal, math teacher and bookkeeper at the secondary school, teaches a math lesson at St. Timon’s secondary school in Rabondo. Risiki Auma Omollo, 7, (right) studies next to Elizabeth Akoth Okinyi, 8, in Edward Olango’s class in the primary school. The students study in dark classrooms because the school is lacking many basic resources, such as electricity. In Kenya, all secondary schools are boarding schools and often are too expensive for students who come from communities like Rabondo to attend. Though the government does not provide school buildings and furnishings, they will provide teachers if a community builds a school. Alone, Timon knew that he did not have the financial means to start building a school structure, “I had to find a way to energize and mobilize some resources, and I found that to do things effectively you have to form a non-profit organization.” In 1998 he formed The Rabondo Community Project USA (The Project), a non-profit organization aimed at improving the quality of life in Rabondo through education and community involvement.